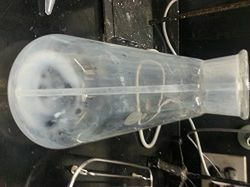 Safety and Procedure: Normal large casting, see 6/18/14, but with 250 mL of acetone instead of 200. 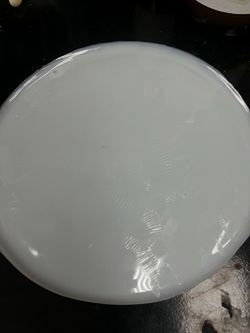 Added 250 mL acetone to TiO2. Sonicated from 8:10 am to 8:20 am at 23°C to 25°C. Added ABS and sonicated from 8:20 am at 23°C to 3:30 pm at 41°C. The solution was smooth when poured into the pan, no flecks of ABS were noticed. Heated the pan at 80°C from 3:30 pm to 7:00 pm. The cast came out very smooth with very few bubbles. A single ABS speck or other contaminate may be seen but overall the casting is very homogeneous. This page was last edited on 27 September 2017, at 00:17.